In a large bowl, combine flour, 2 cups sugar, baking soda, salt and cinnamon. Make a well in the center and pour in the eggs, oil, orange juice and vanilla. Mix well. Stir in the chopped apple, nuts and coconut. Pour into prepared pan. Bake in the preheated oven for 75 to 90 minutes, or until a toothpick inserted into the center of the cake comes out clean. Pour glaze over cake and let stand for 1 hour before turning out. 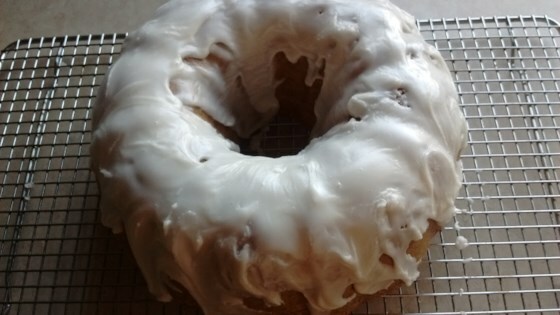 To make the glaze: In a saucepan, combine butter, 1 cup sugar, 1/2 teaspoon baking soda and 1/2 cup buttermilk. Bring to a rolling boil and pour over cake. This cake was ok, i dont see myself making it again anytime soon. The baking time is way too long, it was dried out and I even pulled it out ten minutes early. I have made this cake several times for various functions. Have had many requests for the recipe. YUMMY & my 3 year old can't get enough of it. Thanks! This is GREAT!!. I didn't have fresh apples or orange juice so I used a quart of home canned apples and used the juice in place of the orange juice. Really moist.